Herb and Plow CSA: The Continuing Saga! HOORAY! What a wild time of things! Despite the catastrophic weather conditions causing such a delay, I am looking forward to digging back into the ground candy that we’d become accustomed to during the early part of the year, aren’t you? Although I’m aware that some were getting overwhelmed with the abundance that came their way, I discovered many were distributing their unused portions among friends, neighbors, and less fortunate humans furthering the blessings of the tasty goods. Today I’m sharing a couple recipes from other CSA’s around the country that will help get things back in order in your soon to be filled with bounty kitchens. May the food that passes your lips bring you excellent health, good fortune, and a slimmer waist line (It that is indeed your goal). Eat hearty, my friends! In a deep skillet, add about 1-1/2 inch of water or chicken stock and salt to taste. Add sliced beets. Add 3 T. of butter or olive oil to the skillet. Simmer at medium high heat until all the liquid is gone. Serve immediately. NOTE: The liquid absorbs the flavor, the beets absorb the liquid and the butter/oil, which will float to the top and glaze the beets. 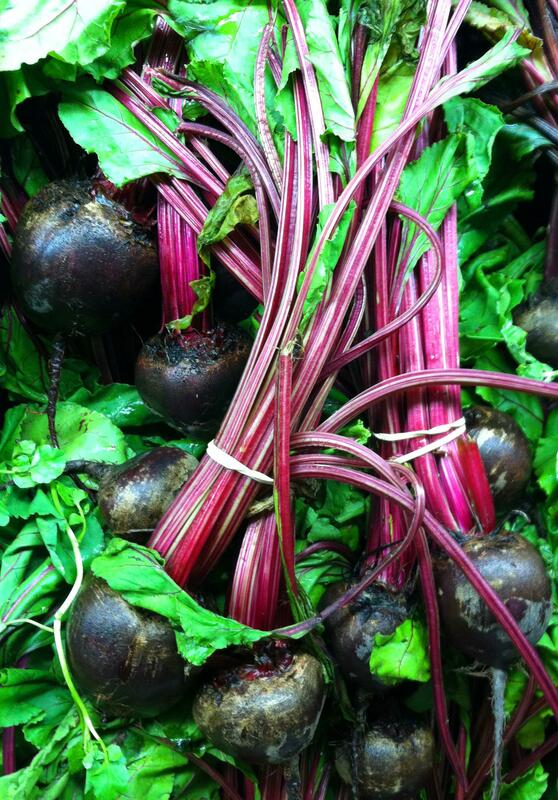 Add any of these ingredients to further the flavor of the beets: fresh ginger, soy sauce, garlic, onions, or fresh herbs. Add, bring to boil, reduce heat and simmer until potatoes are soft. Remove half of the cooked potatoes; puree the rest with the cooking liquid and return to the soup pot. Return reserved potatoes and steamed kale to soup pot. (Puree everything if a smooth texture is desired). Harnish, Marie. “Autumn Soups.” Simply in Season. Scottdale: Herald, 2005. N. pag. Print. Sochacki, Julie, and Jason Houston. One United Harvest: Creative Recipes from America’s Community Supported Farms. Kearney, NE: Morris Cook, 2005. Print. Herb and Plow CSA Week 6: Aruga-what?! This summer has been a crash course for me in what vegetables actually look like, cook like, and what those “exotic” veggies in the grocery store actually taste like. I’ll admit, I’m fond of just sticking to what I know in the food department. I rarely scoop up anything that isn’t in the bargain bin anyway, so this has been quite the adventure. I had no idea what arugula is. I really had to look it up. Go ahead and say it, “Who doesn’t know what arugula is?” I’ll raise my hand and let you know, I’m one of the ignorant. I’m looking forward to trying this. I found an easy quick (as in you can prepare it an hour in advance) pasta dish by Martha Stewart Living. Although her recipes tend to the higher end, this one seems to meet my beer budget while indulging in champagne taste. In the bowl of a food processor fitted with the metal blade, pulse garlic until very finely chopped. Add walnut pieces and arugula; process until a coarse paste forms, about 5 seconds. Transfer to a serving bowl. Stir in the salt and Parmesan cheese, and set aside. Bring a large pot of water to a boil. Add linguine, and cook until al dente according to package instructions, about 8 minutes. Drain in a colander, and immediately add to bowl with walnut-arugula mixture. Drizzle with the oil, and season with pepper. Toss thoroughly until coated evenly. Serve immediately. I am a huge fan of bacon. I say that as I sit here with my well rounded bottom at a computer where my limited mobility talks to my need to be creative instead of active. But, bacon reminds me of family (No, I was not raised by pigs despite my brother’s prodding insults.) I’m originally from Michigan. We’re a hearty stock with rich curves on the women and strong backs on the men. Bacon was served commonly for breakfast, so to me, it feels like home. Here is a Paleo Recipe I found that will help the abundance of summer squash have a rich flavorful compliment.